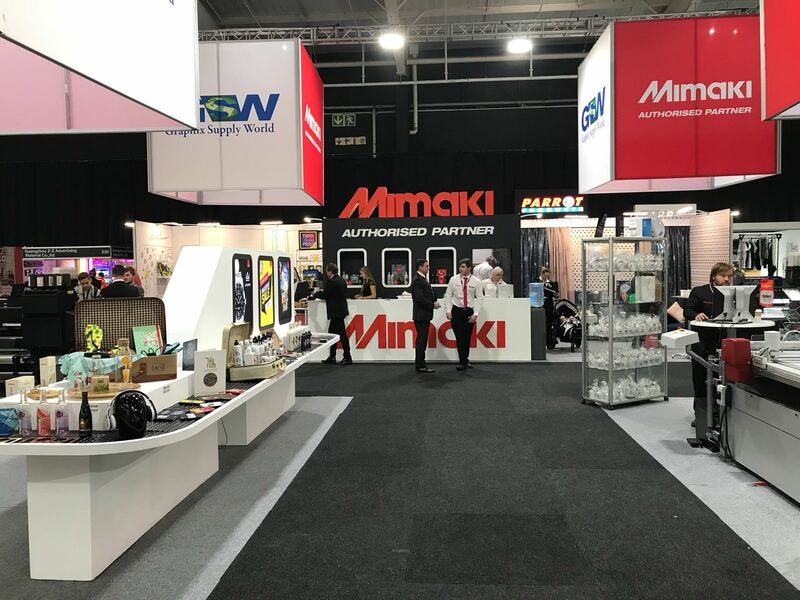 This innovative new Mimaki JV400LX latex printer satisfies the increasing demands of the signage market by being cooler running, more energy efficient and yet delivering breathtaking print quality, with an even wider colour gamut using more ecologically friendly inks and is also the world’s first latex printer to feature white ink. The innovative water based latex inks are odourless and feature no hazardous VOC’s (volatile organic compounds) and are HAPs (Hazardous Air Pollutants) free. This eco-friendly ink does not need special ventilating equipment and is better for the environment. Available in 4 colours (CMYK) plus white to provide endless versatility. Mimaki latex inks come in eco-cartridges that can be repeatedly used by changing spent ink packs. This eco-cartridge method contributes to waste reduction and can provide ink at lower prices. Ink pack capacity is 600 ml. The addition of white ink provides the flexibility to print to a wide range of media including transparent PET, window decoration and shatterproof window film. Two newly developed print heads with four rows of 320 nozzles per head are arranged in-line. The result is top quality, high speed printing. Eight ink cartridges can be inserted and colour configuration can be selected at the time of installation. 6-colour mode features Orange, Green and white ink (CMYK Orange and Green + White), which is especially suitable for printing on transparent and coloured material. A double CMYK 4-colour mode can also be selected for higher productivity. 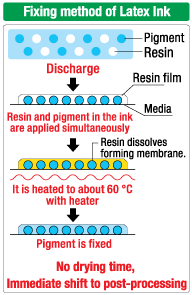 Latex ink fixes pigment to media because resin contained in the ink dissolves with the heater, forming membrane. 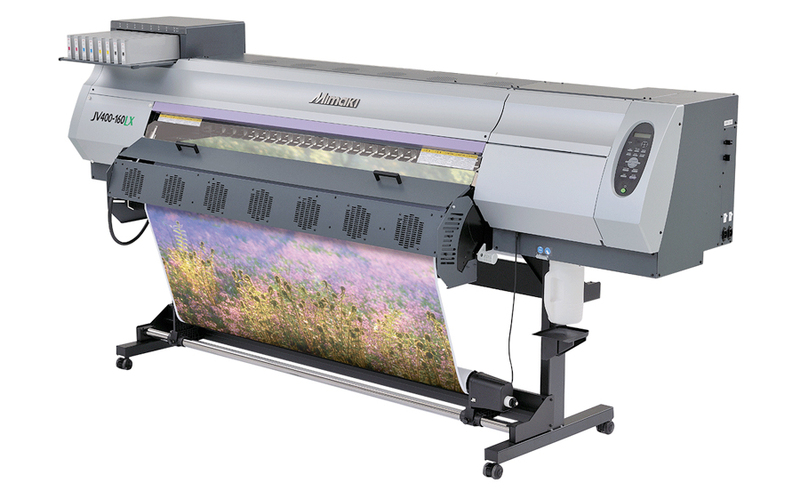 Therefore, it can be printed on a wide range of media, including PVC film, banner material, backlit, blueback paper, and more. Non-coated media without acceptance layer, such as paper and textile, can also be printed with latex ink. 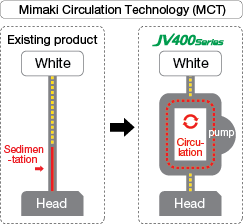 Mimaki latex ink can be used to output on heat deformable or discolourable materials including PET. It also contributes to reduction of color blurring due to high temperature. Combining its excellent media capability with cold cure, Latex Ink can meet the diversified needs of clients in a finer, more versatile and higher quality manner. When using Mimaki latex inks, fixation and curing is immediate. Post-processing, such as lamination, can be performed immediately, dramatically increasing efficiency.